What would it take to increase your conversions by 10%? From a strict media investment approach, you would likely expect to increase 15-50% depending on where you sit on the optimization curve. Most marketers expect linear returns from their investment which will almost never occur. As the cost of underlying media increases, it is even more unrealistic to expect linear improvement through media investment alone. Conversion Rate Optimization (CRO) and personalization should be treated as vital components of your digital marketing strategy. Today’s customer expects tailored, personalized and relevant experiences when interacting with brands. By employing a robust testing strategy, advertisers can continually optimize how consumers engage with their website or app, increasing conversion rates and turning website traffic into revenue. Advertisers so often focus on optimizing the attraction phase of their marketing campaign, while under-investing in the nurturing and onsite experience phases. To help solve these issues, there have been some major changes in the CRO landscape recently. Google introduced a free version of its Optimize 360 product (Google Optimize), and Optimizely has relaunched its product. These are robust options brands need to consider to ensure the best CRO and personalization experience for consumers. Google announced the release of Google Optimize late last month, the free version of Optimize 360 (Google’s Enterprise Optimization offering). There’s no doubt that it will be a big shake up in the industry and a direct threat to Optimizely. One of the major value adds of Google’s offering is its native integration with Google Analytics 360 and Tag Manager. This will allow advertisers to quickly and easily highlight areas for improvement on their websites. In turn, advertisers can leverage these insights to test and deliver personalized experiences across the entire customer journey. This concept isn’t necessarily new as it already exists within Optimizely; however, it is seldom an area that businesses focus on. Last month at Opticon (Optimizely’s annual product update) in San Francisco, Optimizely launched its new product, Optimizely X, which is being dubbed as the world’s first Experimentation Platform. As part of this launch, Optimizely has introduced some shiny new features that enable advertisers to truly experiment everywhere. One of these new features, Optimizely X Mobile, allows testing within mobile apps (Android and iOS). Additionally, visual changes to an app can be made instantly, without the need for app store reviews. Another great new feature is Optimizely X Web Recommendations which allows advertisers to automatically add product, content or category recommendations to any page. This feature may prove to be very beneficial for e-commerce advertisers, allowing for the ability to experiment on where recommended products appear and how they are presented. The free version, Optimizely X, became available for a 30 day trial earlier this month in various markets. Which product is right for your brand? Simply put – it depends. Many of the core testing features are available across both Google Optimize 360 and Optimizely X. The real benefit for choosing Google Optimize 360 is its native integration with Analytics 360. This makes it easy to leverage existing goals, events and key audiences within Analytics 360, as well as the ability to use Google Tag Manager Data layer variables for testing within Optimize 360. All of your testing data within Google Optimize is also available within Analytics 360, allowing you to analyze results within a familiar platform and report against existing business metrics. For brands not using Google Analytics 360, Optimizely offers certain features not available within Google Optimize such as multi-page experiments, mobile app testing and third party integration with heat mapping technology such as Crazy Egg. Both platforms offer free starter plans (Optimizely has a full features trial available for 30 days). In the Opticon keynote last month, Dan Siroker (Optimizely CEO) opened with an example of Google having a culture of experimentation – experimentation is key to its success. Brands need to follow the same mentality if they are to continue to innovate and drive greater results. This includes personalization; customizing your website allows you to personalize user experiences based on his/her preferences and demographics. A recent Econsultancy report found 94% of companies see “higher engagement and conversion rates” as benefits of committing to customer experience. By employing word-class personalization technology such as Optimizely X or Google Optimize, brands can provide one-on-one experiences for its consumers and move away from the ‘one size fits all’ approach. These personalization experiences can create real value and long term increase in revenue. A prime example of personalized content is Netflix, offering individualized user profiles. These allow for more customized content recommendations for the user. As a result, users end up consuming more video content on their account. When Netflix rolled out this feature back in 2013, you can bet they tested the concept first. “As Google does, most of our work is also proven or disproven by A/B testing. Only that which leads to an improved experience gets rolled out to everyone.” (Netflix Investor Relations). Today, personalization and A/B testing are things that savvy brands should be embracing to stay ahead of the curve. The role of a digital advertiser is focused on delivering the right message to its audiences at the right time. 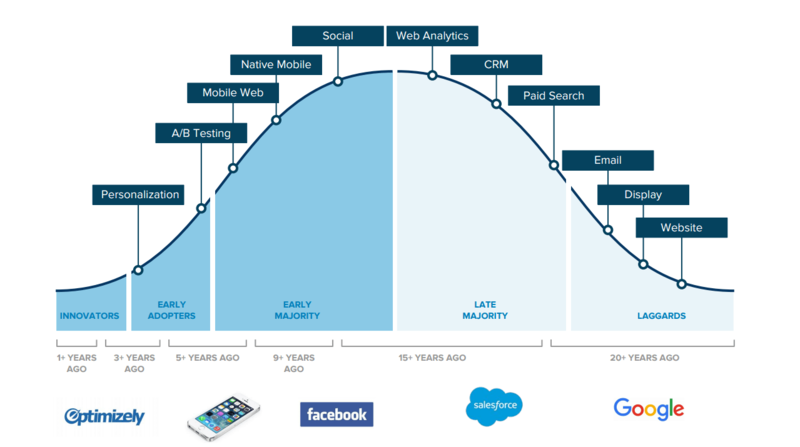 The technology landscape is changing in the world of CRO and personalization with the likes of Google making its product available for free. Personalization and CRO are highly complex, but are also natural extensions of your digital marketing efforts to ensure your visitors turn into customers. To learn more, contact Performics today.